He is a great man,among the very few Nigerians i look up to. "A country known more for E-Mail scams than manufacturing." What a Shame! "...a nation known more for email scams than manufacturing". A lot of everything that happens in life depends on connections. Your fortunes depend on who will be able to open the door for you." Did they have to mention email scam? Did it have anything to do with Dangote? It's an insult on Dangote, Nigerians, Nigeria and Africa. Are other countries and their citizens and even Americans not committing worst crimes than email scams on a daily basis in Nigeria and Africa? Whoever wrote that article in LA Times is a worthless scumbag. Shame on LA Racist Times. I am so proud of you Daddy! Hmmn ppl can like 2 claim. Hehehe, does he knw dat he's ur father??? Make you hire journalist for naija.. let them bring news for you. Hire paparazi make them dey follow celebrities and bring news for you. As you don reach these level, make you utilize on it! Daddy ko,baba ni? Who dash monkey banana! In ur nightmare when u violently forced him *with a gun to his head* to be ur daddy in dat dream. Mtchewww,joseph d dreamer! The power of the pen! Whose voice is heard,and whose voice is not heard.I am surprised they did write that Nigeria brought HIV to this world. I just read through the "the world bank report" link the LA Times quoted.Do they know that there is a difference between NIger and Nigeria. Ghana was ahead of Niger in that report and Nigeria was not even mentioned. Nigeria was behind Ethiopia and Malawi in oil production, not in other things. The journalist who wrote this is an ignorant racist! When willl the "email scam" references stop? There are many more Nigerians like Dangote that the world has not heard of. Many Nigerians are working their butts off to create businesses so that they can gain the respect of the world, yet the "email scam" nonsense is what people still talk about. Let me break it down for you.Nigeria has 150 million people, out of the 150million people, I would say that less than 0.01% are email scammers (just to put things into perspective).Young Nigerians are making their mark in the world in music, fashion, business, education,medicine, and more. People are starting to take notice.American Record execs are signing Nigerian ArtistsHollywood producers are working with Nigerian Film Makers to bring their movies to the rest of the world.Top World Renonwed fashion power houses are paying homage to the Nigerian CultureCelebrities are Flying to Nigeria in record numbers to be a part of the "Nigerian Experience"International Businesses are opening up shop in Nigeria because they recognize the potential for success.Nigerian educators are being recognized for their work.Young Nigerians who went to ivy league schools overseas are going back home in droves to contribute to the growth of their country.So while I commend the author of this article for introducing Dangote to the worls, he should know better than to reference "email scams". It's just so 90's! Not my role model, he is a dirty business man,he is one of the people that ruined the stock market. Asper ususal the western world will always find it difficult to give true undiluted recognition to africans/blacks without throwing a splash of dampeners on it, its their way of showing systematic hatred and institutionalized racism. 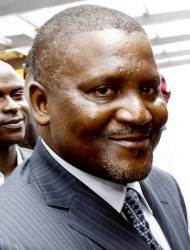 The author spent more time being sarcastic about the acticle than giving fair dues to dangote for his achievements. Yepaaa!! Daddy ke @Anon 04:15pm.. Dangote pikin dey dis blog..hmmm pls can we be friends?? Linda no dulling oooo..opportunity cms but 1ce.. Celebrate 1 of ur own n quit d criticism. Na wa ooo! well, at least some good publicity. Oponu, @Anon 3:15, that is why you can never be a billionaire like Dangote, when all you think about, ALL YOUR LIFE is your "next bottle". Dodoyo, better go and sit down and think about your life and check whether you're headed anywhere at all. Shio! Bia...al dese LIB readers dt b formin janded...abegi...e don do! Wetin sef? If ur location is nt necessary to d comment,save it biko. Kilode! 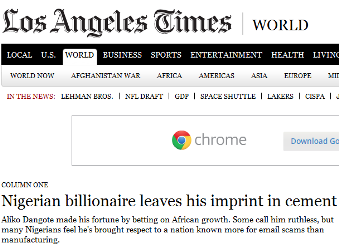 Nd 4 LA Times,its nt deir fault @ al...awon oloshi..aw is d 'email scam' bit relevant to d story? If I catch dt writer ehn...she wud knw bera nxt tym.ode oponu alakoba oshi ti oni ikole! It's not for free. People pay to be featured is these capitalist media.